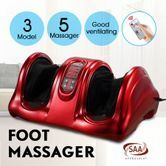 Sit down and get your feet ankle and calf a relaxed thorough massage to rub away all the tiredness after a long-day walking with this brand new Foot Ankle Calf Massager Foot Circulation Machine – Red. This foot circulation machine is the ultimate in relaxation. Controlled by Microcomputer, this handy foot blood circulation machine is the equivalent of a real massage, which can be used anywhere anytime, after a bath, before sleeping or while watching TV. The footmassager features 3 levels of speed - high medium and low, and with the easily accessible and easy-to-use control panel or the remote controller, you can customize the massage to just the right pressure and speed. The zip-out hand-washable fabric liner makes cleaning much easier. Enjoy the star massage treatment everyday at home with the red foot massager! People can have stronger feeling to enjoy the finger pressing massage in kneading. Easy move it by anybody with small measurement and weight. I havent been able to walk comfortably for almost two years. I have plantar fasciitis which means that when I stand up after lying still for more than half an hour I have a sharp stabbing pain in my left heel and the arch of my foot.After just one week - I still cant believe it I can walk easily without pain. This means I can get back on the treadmill and lose some of the weight Ive put on from not being able to exercise for too long. Im going to get one for my dad too.